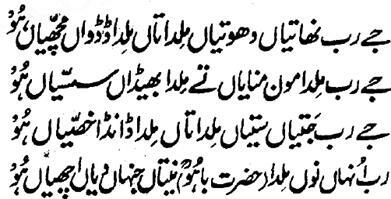 Hazrat Sultan Bahu Rahmatu-Allahe Ta-aala Alaihe says that many Seeker, often, do hypocritical actions in order to find Lord. That is, all the time, they are seen doing Ablution (Wuzu) and washing clothes. If Lord is found by these actions, the frogs and fishes, that all the time live in water, can become Waasil with Allah. Some claim to be Qalander by shaving their faces and heads. If Lord were to be found after getting the hair 'cut', He would have been found by the sheep and goats. 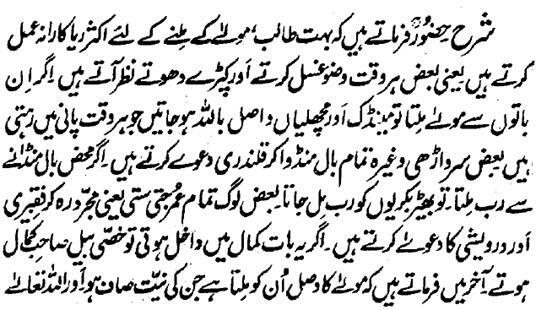 Some people remain bachelor for their entire life and claim to be Faqeers and Dervishes. If this action were a thing of perfection, the sexually impotent bulls would have the Masters of Perfection. At the end, he says that 'the Wasal of Lord comes to the share of those people, who's Intention is clear and they do not assign any Outsider in the Worship of Lord.